Archduke Charles with his staff during the battle Aspern. 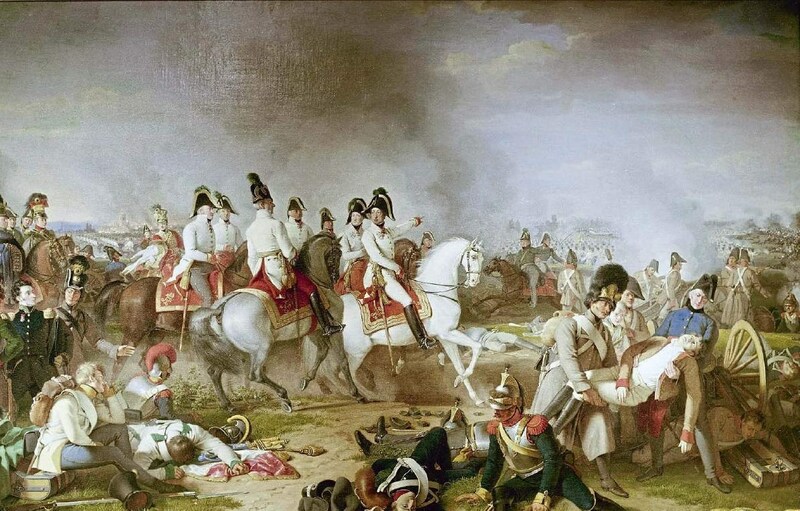 Without a formal declaration of war, the Austrian army opened hostilities on April 8, 1808, by invading Bavaria. Soldiers: The territory of the Confederation has been violated. The Austrian general wants us to flee at the sight of his arms and to abandon our allies. I will be with you at the speed of light. Soldiers, you surrounded me when the Austrian sovereign came to my bivouac in Moravia. You heard him ask for my clemency and swear eternal friendship. Defeated in three wars, Austria owes everything to my generosity: three times it has perjured itself. Our past successes are a certain talisman of victory that awaits us. Let us march, and at sight of us the enemy will recognize their conquerors! Commanded by Archduke Charles, the Austrian army was a family affair. Composed of 320,000 active soldiers and 200,000 Landwehr (the recently created territorial militia), this army was divided into three groups: (1) Opposite the Rhine, a striking force of 220,000 combatants under the direct orders of Archduke Charles. Archduke Ludwig commanded a corps; (2) In Italy, 60,000 soldiers commanded by Archduke Johann; (3) Opposite Poland, Archduke Ferdinand had 20,000 men. In the capital, Vienna, a garrison of 20,000 remained under the authority of Archduke Maximilian. A European force of more than 270,000 men, Napoleon’s army was not composed of his best troops, who were engaged in Spain. The emergency mobilization of this army was barely completed in time. It was deployed in four theaters: in Germany, the Army of the Rhine, with 180,000 combatants under the direct control of the emperor; in Italy, 60,000 soldiers commanded by Prince Eugene; in Dalmatia, 15,000 men with Marmont at their head; and in Poland, a corps of 15,000 Poles commanded by Poniatowski. The cost to the enemy would have been much heavier if Napoleon had possessed sufficient cavalry, much of which had been left behind in Spain, for the pursuit. Vienna capitulated on May 13. In Italy, Archduke Johann retreated to Hungary, where he suffered defeat at Raab on June 14. The conquest of Vienna did not end the war, however. The Austrian army had suffered very heavy losses but was not completely out of action. Its remnants regrouped and reorganized east of the capital, sheltered by the Danube. There would be no peace without a decisive victory on the far bank of that river. The emperor would have to reengage the Austrians twice more: at Essling (also known as Aspern) on May 21-22 and at Wagram on July 5-6. In the aftermath of capturing Vienna, the emperor decided to pursue Archduke Charles. He crossed the Danube some ten kilometers south of Vienna, opposite the island of Lobau, using it as a platform from which to launch a bridgehead. For this purpose, he had a great bridge constructed across the wider arm of the river, on the friendly side, as well as a shorter bridge on the enemy side. 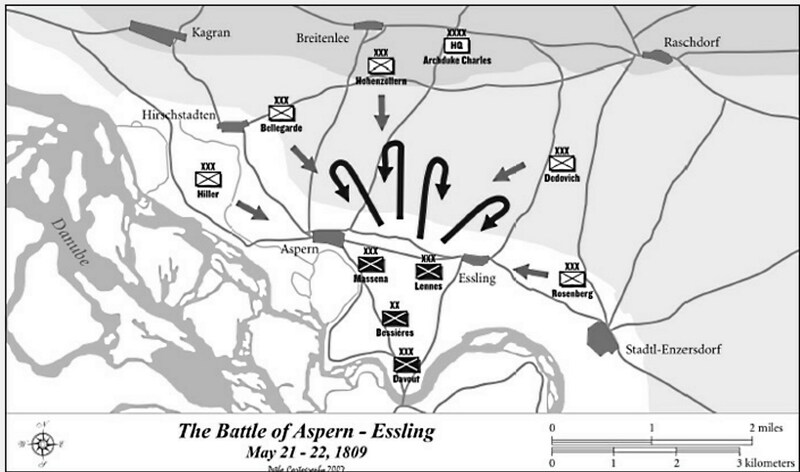 The French established a bridgehead on May 21, including the villages of Aspern and Essling. The bridgehead successfully withstood the Austrian counterattack and continued to expand. The next day, Napoleon personally commanded a general offensive. Beaten, the Austrians retreated in disorder. Lannes was on the verge of penetrating the Austrian line when the news arrived that the great bridge had been destroyed by fire rafts that the enemy had launched from upstream in the Danube. The flooded Danube made this particularly destructive. Davout’s corps, which was supposed to exploit the breach, was unable to reach the battlefield. The victory was lost! The archduke immediately exploited this gift from heaven. With a numerical superiority of four to one, he counterattacked with all his forces, aiming to destroy the bridgehead that suddenly had been deprived of all hope of support. A nameless butchery ensued, impossible to avoid for lack of any room to maneuver. 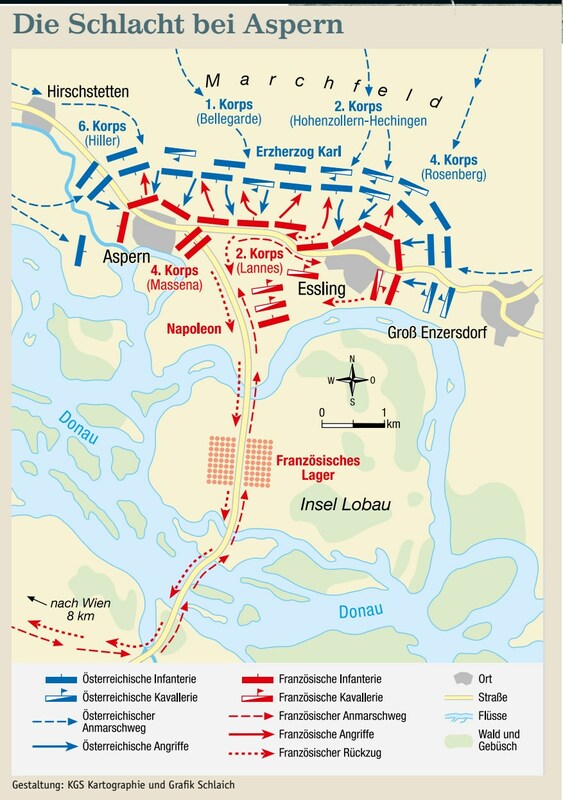 Aspern and especially Essling were taken and retaken repeatedly. The slaughter was equal on both sides. Lannes, the “Roland” of the army, was mortally wounded. Gazing helplessly at this carnage, Napoleon barely escaped himself on several occasions. The bridgehead resisted all day. Yet, its survival depended on withdrawing to the other bank of the river. During the night, Massena performed a masterwork in the delicate task of disengagement. Because of this bridge, the emperor lost a decisive victory while mourning the cost of 18,000 killed and wounded, slightly less than the Austrian casualties. The decisive battle remained to be fought. After the butchery of Aspern-Essling, the two belligerents had to lick their wounds and reorganize, which explains the forced 43-day truce that followed the battle. Encouraged by his partial success at Essling, the Archduke decided to give battle on the Marschfeld between the Danube and Wagram. He had reorganized his forces, bringing them up to 180,000 men and more than 400 cannon. Napoleon transformed the island of Lobau into a gigantic operational base crowded with a strike force of 150,000 men and 450 guns. All Europe held its breath. On a field measuring 15 by 10 kilometers, more than 300,000 men confronted each other in a sort of judgment of God, to the deafening sound of 800 artillery pieces. No one had ever seen a battle of such scope. Napoleon opened hostilities on July 4. While making a diversion toward Aspern, he launched a surprise crossing of the Danube during the night of the 4th to the 5th under cover of the sound of the river, and three kilometers away from the diversion. Without pausing, he attacked the Austrian positions all along the line. The archduke expected an envelopment, especially on his left so as to cut the natural line of communication with Bohemia, from which must come any reinforcement from Archduke Johann. This was the type of maneuver that any good tactician might undertake and that the emperor had taught the Austrian army to expect during the past 13 years. Yet, Napoleon again deceived his adversary. His secret thrust was to strike where he was not expected, at the vulnerable point in the enemy’s dispositions. Reinforcing the wings of the Austrian line out of fear of an envelopment had of necessity weakened the center. It was there that Napoleon would apply his offensive effort. And at that point stood Wagram. 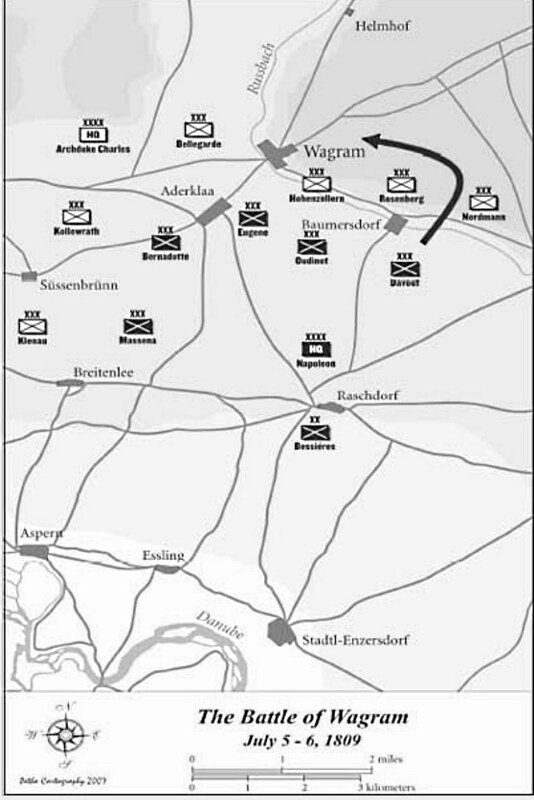 After several hours of relentless combat, Wagram was on the point of being taken and the Austrian line broken. At that moment, a foolish event occurred that put everything at risk. Reaching the Wagram plateau, two of Bernadotte’s Saxon battalions were attacked by Macdonald’s Italians, who mistook them for Austrians because of similarities of uniform. This produced a rout in Bernadotte’s corps, a rout that the Imperial Guard had enormous difficulty in containing. Oudinot’s neighboring corps was constrained to pull back to protect its flank, and the Austrians profited by sealing the breach in their lines. An imminent victory dissipated in a few seconds. Night approached, forcing the opponents to recommence on the next day, July 6. But this time it was the Archduke who took the initiative, undoubtedly emboldened by the French disappointment of the previous day. Beginning at 4:00 a.m., he launched a violent attack on the French right, held by Davout, as much to preempt any attempt at envelopment as to make a diversion. Soon thereafter he attacked Massena on the left wing, along the Danube, with the evident intention of cutting Napoleon’s communications with the island of Lobau and seizing its bridges. The archduke attempted to strike a blow similar to that of Napoleon at Friedland. 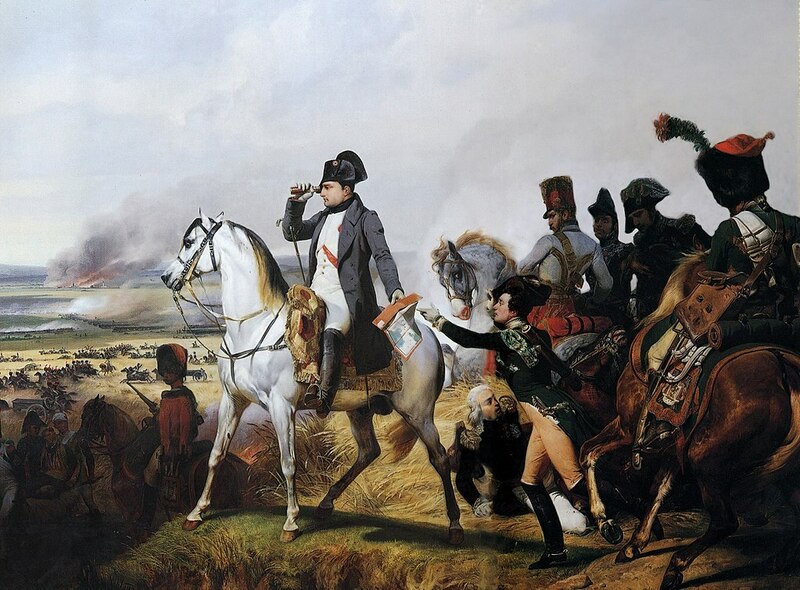 Napoleon was on the point of succeeding when Bernadotte’s Saxons again routed, dangerously exposing the right wing of Massena, who already had all he could handle. Under fire, the emperor moved quickly to Massena. With one accord, the two organized a defensive block to halt the Austrian envelopment. Napoleon did not forget his own plan, which the archduke’s dangerous offensive had indirectly favored. Charles’ pronounced effort on his right had of necessity denuded his center, in the area of Aderklaa-Wagram. In that region, the emperor rapidly reassembled a striking force destined to slice open the Austrian line. At 9:00 a.m., the emperor ordered a general counter-attack. All units advanced at the same time. In the center, on which everything depended, the artillery concentration would enter history under the name of the “Battery of Wagram.” Concentrated on a one-kilometer front before the assault troops, more than 100 cannon fired simultaneously, pulverizing everything with their shot and shell. Continuing to fire, they advanced in good order for two kilometers, always in the lead. After having thus opened the breach, the artillery gave way to Macdonald’s infantry as well as the cavalry and the Grenadier Guards. At 2:00 p.m., Archduke Charles recognized his defeat and ordered a timely general withdrawal toward Bohemia, thereby permitting a large portion of his forces to escape Davout’s pincer movement. Disheartened, the Landwehr recruits threw down their arms and went home. The exhaustion of the French troops prevented an immediate pursuit. Despite this delay, the Austrian rear guard was defeated at Znaim on July 11. Fearing total destruction, the archduke requested an armistice, which Napoleon authorized against the advice of his marshals. “Enough blood has been shed!” he told them in the episode already recounted. At Wagram, the Austrians lost 44,000 killed, wounded, and captured, as well as 20 cannon and ten regimental colors. The French suffered 30,000 killed and wounded. Among the dead was the legendary light cavalryman General Charles Lasalle. 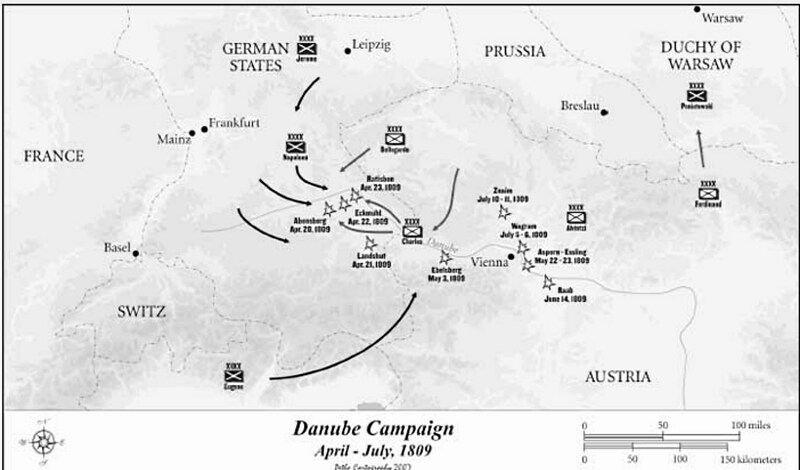 The 1809 campaign in Germany was finished, giving way to peace negotiations. Speculating on the results of the British landing in the Netherlands, the Machiavellian Klemens von Metternich, who had replaced Stadion as Austria’s foreign minister, temporized for three months. The disastrous outcome of the British expedition at Walcheren on September 30 convinced him to sign the Treaty of Vienna on October 4, 1809. Napoleon permitted Francis to retain his crown, but severely punished his perjury by reducing the Habsburg possessions. Bavaria, an active and courageous ally of France, received the Austrian region of the Inn. Russia, surprisingly, gained a portion of Galicia (Ternopol). This gift to a fainthearted ally illustrated Napoleon’s obsession with peace in the east. He would be poorly repaid for it! The Grand Duchy of Warsaw received the other part of Galicia (Cracow). The remaining Austrian possessions on the Adriatic, including Trieste, Fiume, some remnants of Carnolia, and Croatia, were transferred to France for their strategic importance and as a portal to the east. They became the Illyrian provinces. In addition to these lost territories, Austria was to pay an indemnity of 85 million francs. To demonstrate yet again that he cherished no territorial ambitions in Germany, Napoleon immediately abandoned his military positions, with the exception of Westphalia and the Prussian fortresses, which were indispensable pledges for the security of France. But, like its predecessors, the Treaty of Vienna was considered by France’s enemies to be nothing but a new and temporary ceasefire. Two-and-a-half years later, it would again be Russia’s turn in the tag team of war. This entry was posted in Austria, France, Wars by MSW. Bookmark the permalink.